Pro overclocker Dancop, AKA Daniel Schier, has scalped a new SuperPi 32M record. 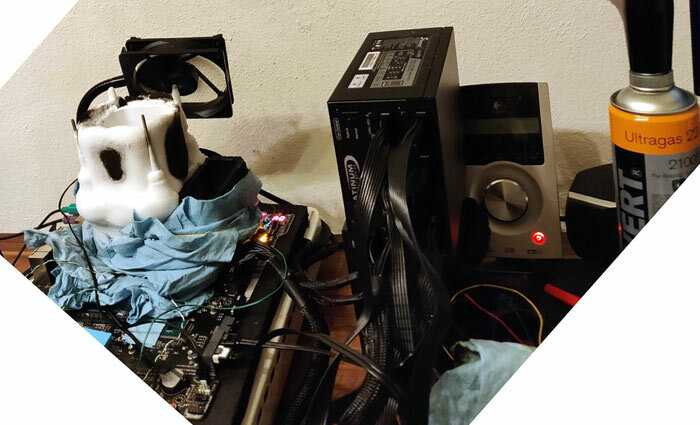 The achievement is a little unusual as Dancop overclocked the popular Intel Core i7-8700K processor for his record but leveraged a 200-Series Intel chipset motherboard- something that isn't supposed to work. The unlocked Intel Core i7 8700K Coffee Lake-S processor used by Dancop operates out of the box at 3.7GHz base / 4.7GHz boost frequencies, but is of course designed to be easy to overclock as signified by the 'K' suffix. 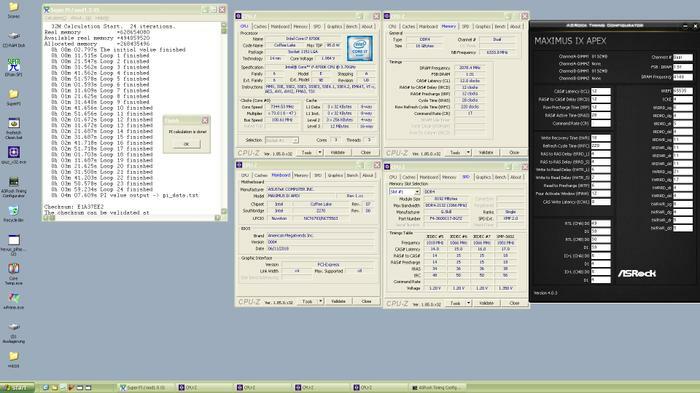 The overclock achieved was 7,344.53MHz (recorded by HWBot as +98.50 per cent). However, the i7-8700K was run with just 3C/3T active rather than its default 6C/12T config. Disabling cores is a common trick by the OC experts, for great headline GHz figures, but on the other hand Dancop was aiming for a record SuperPi - 32M score. It looks like he chose to disable half of the physical core count and turn off hyperthreading for the optimal performance in this case. To complete its 24 iterations of SuperPi 32M the above CPU scored 4min 7sec 609ms - that's about half a second faster than the previous world record. Looking at the hardware used, we already noted that Dancop used a 200-Series chipset motherboard, an ASUS Maximus IX Apex, to be precise. For these two components to work together a user needs to apply a couple of patches to get Coffee Lake CPUs to run on this older motherboard series - but it is a common practice for overclockers, notes HardwareLuxx. A clock speed of 7,344.53MHz was achieved using a multiplier of 73.0x, with the baseclock left at 100Mhz, and a voltage of 1.984V. An LN2 cooling setup was used to chill the CPU and motherboard VRMs. Other system specs included; 2x 8GB (dual-channel) G.Skill Trident RAM. The memory ran at 2,078MHz, at timings of 12-12-12-28-1T, which corresponds to DDR4-4160. Windows XP was the OS of choice. In the picture the North Bridge works at 6333.8 Mhz, from the settings i see the RAM would run at DDR4 - 4160Mhz, heck the world record for ram is 5500 Mhz that means DDR4-6333.8 would be a new world record. I'm sure this is useful…to absolutely no one. What strikes me here isn't the overclock. It's the fact that Intel insists you buy a new motherboard rather than letting you use the old one. Yet here these supposedly incompatible parts work together so well and remain so stable that you can do this kind of O/C on it. It's really exposed how anti consumer Intel really is. As is that comment. If you not interested in overclocking then don't read about it, no one said you had to. What's next “I'd rather play ON my computer…” If that's what you want fine, but some of us like overclocking as an engineering hobby, not every one just wants to play Minecraft and troll people on their computers. Some of us are interested in how they work and how to make them work better, even if we can't replicate it at home.